My mother was actually the one who gave me the idea for these. I was desperately trying to figure out what else to bake for Thanksgiving when she made the suggestion of pumpkin cupcakes. I liked the idea but had always avoided making cupcakes for special occasions because it seemed like there was so much more that could go wrong. But the idea stuck and despite having a full week before Thanksgiving to prepare I still didn't have the recipe finalized until the morning I started baking. The reason (if there is one) was that I was moving back and forth between two recipes. The main difference between them being the use of cake flour vs ap flour. Eventually I chose neither and instead decided to adapt my banana cupcakes (my favourite cupcakes, period) to a pumpkin version. I figured that the consistency and properties of pumpkin would easily translate as a replacement for banana (though given the fiasco with the brownies, who's to say? :)). And despite using my own recipe the inspiration for these were definitely the pumpkin cupcakes from Culinary Concoctions by Peabody. To what end? 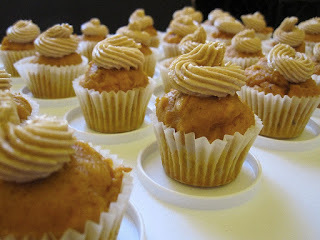 Well, I used Peabody's exact measurements for spicing the cupcakes, but more significantly, I borrowed the terrific idea of the brown sugar frosting. Other than that and the addition of some brown sugar, the recipe is identical to the banana version. The reason for the brown sugar was twofold. First, to compensate for the missing sweetness of the banana; and second, because all pumpkin recipes should have a little brown sugar :). As for the frosting I was determined to make a boiled version. This is the third time that I have made a frosting of this type and for the third time I couldn't be happier about how it turned out. This is my favourite frosting method by far. The cupcake comes together as most do and as long as you have your ingredients ready and waiting its very quick. The frosting is no more difficult, except for the mandatory cooling time, which I actually allowed to occur naturally this time. Although as a warning, the ease of the frosting definitely depends on whether or not you have a mixer. It requires a rather lengthy whipping time before its volume increases significantly and it becomes smooth. As with everything else this Thanksgiving I was most nervous about the baking. I knew the perfect timing for the banana cupcakes but was unsure how these ones would translate. In the end I had three versions with three different bake times. I made sure to taste at least one cupcake from each batch, you know, for science :), and each was done enough but surprisingly none seemed overdone. Though whether or not they paired well with the frosting was going to wait until the morning. Speaking of the frosting, you may notice that the cupcakes weren't frosted with my trademark sloppiness. My aunt supplied me with a set of pastry bags and tips when we made butter tarts together, and this was the first opportunity I had to try them out. I honestly had no idea what I was doing. I couldn't figure out how to put the tip on the disposable bags and then I didn't know what tip to use. I picked the one that looked like it would have some type of design (though I'm sure they all do). I'm not even sure I know which one it is, but for once my frosted cupcakes didn't look horrible. Yay me! The cupcakes that I had "tested" without frosting were really good. Not super light, but not dense like a muffin either. They were moist, perfectly spiced and just sweet enough. However, when paired with the brown sugar frosting the cupcakes reached any entirely new echelon of flavour. 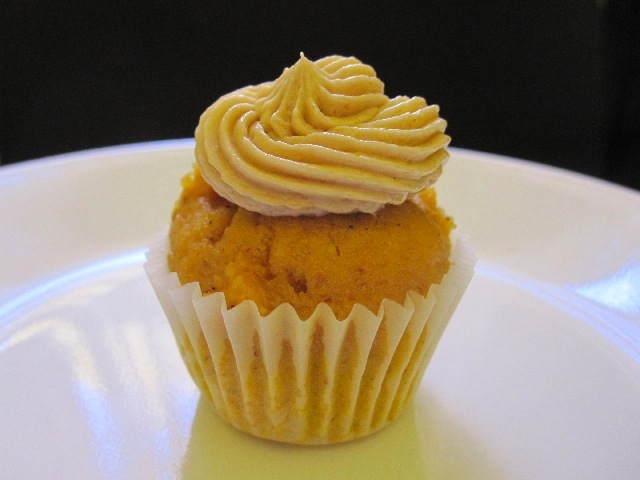 The frosting was sweet but not so much as to overpower the flavours of the pumpkin and the spices in the cake. A top to bottom bite gave you this super creamy, wonderfully light brown sugar sweetness, followed by the fluffy pumpkin spiciness of the cake. It was so good. Beyond good, it was fantastic! And as much as I love this cupcake, the frosting stole the show. I don't think I've ever loved a frosting as much as I love this one. Even with an entire stick of butter, it never feels too rich or heavy. It almost has the same consistency of a whipped cream. It's just that light, flavourful, and good. Truly spoon worthy. It's not often that I gush over a cupcake, and I think this is the first time that I have ever gushed over a frosting. And I wasn't the only one either. Everyone loved them, everyone couldn't stop eating them. Along with everything else, I brought two dozen completely frosted pumpkin cupcakes for dessert and they were all gone by the end of the night. Such a thing has never happened before. There is typically a little bit everything left over. And the two dozen extra I had sitting at home? Well those didn't last very long either. These cupcakes are probably the best things I have baked in a while and oh that frosting. "How do I love thee? Let me count the ways. One one-thousand. Two one-thousand. Three one-thousand. Four one-thousand...."
Preheat oven to 350F and prepare a mini muffin pan with paper liners. In a medium bowl add flour, baking powder, cinnamon, nutmeg, salt and cloves and whisk to combine. In the medium bowl of a mixer cream together butter and sugar until pale and fluffy. Add oil and vanilla and mix on medium speed until completely combined. Add eggs one at a time, mixing until incorporated. 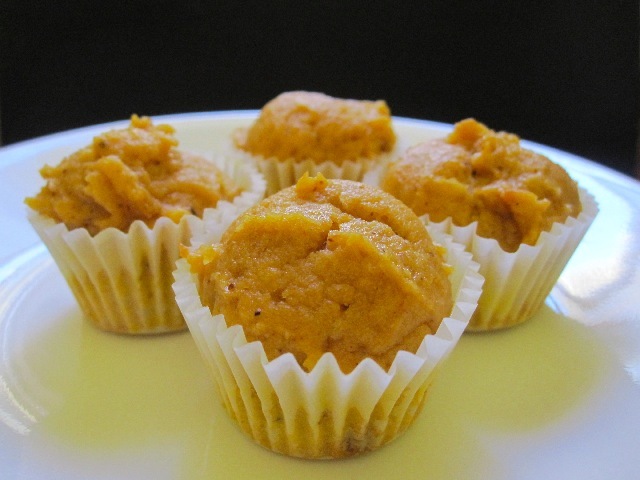 Add pumpkin puree and mix until fully incorporated. Reduce mixer speed to low and slowly add dry ingredients until just incorporated. Evenly distribute batter into prepared muffin pans and bake for 9 to 11 minutes or until toothpick comes out clean and muffin edges are just starting to brown. Allow to cool in pan on rack for 2 to 3 minutes before removing and cooling completely. In a small saucepan add flour, salt and 1/4 cup of milk and mix until combined. Add remaining milk and salt, and turn burner to medium heat, whisking continuously until a paste is formed. In the small bowl of a mixer add butter and brown sugar and beat on medium until fluffy. Add vanilla and beat until combined. Add the flour mixture and beat until light, fluffy and smooth ---don't worry if it doesn't look like anything is happening, it takes a while and will at least double in volume when ready. Oh my goodness! I am gushing at them, just looking at them! I think I may make them for 'my' Thanksgiving, too! I love the frosting idea, and like your description of the sturdy, rather moist, not too light cupcake. Thanks Mary! I think that's my first "gushing" comment ever :). This is one of those recipes that as soon as they were gone I wanted to make them again. Hope if you try them you like them as much as I do :) (especially the frosting :)).